Lookin forward to your premium this year! Fantastic violin. I knew the day would come when I would regret pledging pre-Marathon. It's the Choo-Choo Edition! Hi DJ Bethany! Didn't I see this fiddle in the recent Lego Movie? Yeah, but you have twice the number of followers I do. Whoa now Danne, don't bust Twitter (again)! Hi Bethany and Bryce! Go go go! Gosh, do I ever wish I knew about this fiddle before I blew my pledge budget. Ranjit, that is a magnificent donation right there. 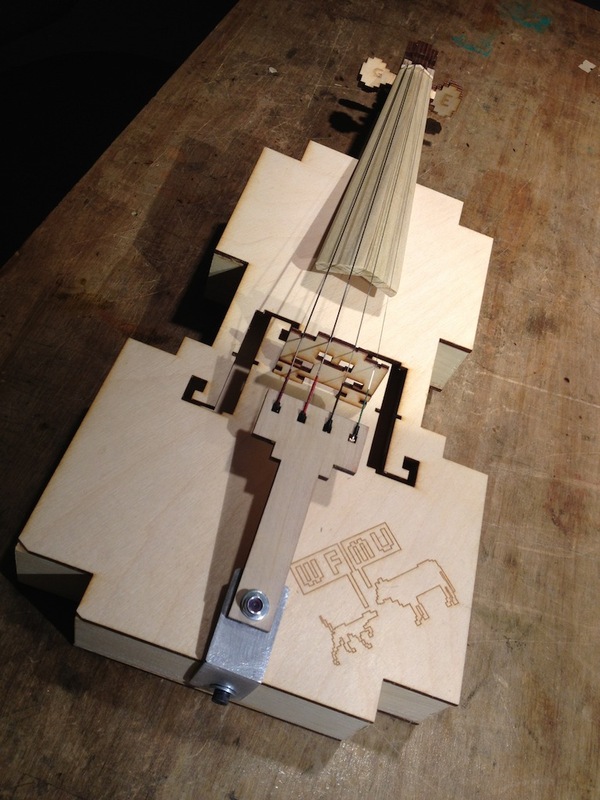 Here's a piece you will wish you knew how to play with your new 8-bit violin. Thanks! Bethany helped build it! Ok folks, let's keep those pledges coming in! wfmu.org show the love! this Andrew Bird CD is up for grabs now to pledges of $15 or more! Whatever the hell this is, I'm starring it!! Hey! I am stuffy and sleepy, though not stodgy. What was a song about Tiger? Stuffy! And sleepy! And bursting with love! Stuffy! And sleepy! And bursting with love! Stuffy! And sleepy! And bursting with love! Stuffy! And sleepy! And bursting with love! Bach is not stodgy, either. Hi Matt! @Jake: my three favorite dwarves! Stuffed to the brim with love and BURSTING out! Hi davex! Bach is vivacious, not stodgy! 50%. i like them odds. c'mon people, make me like 'em less. Okay, I posted it on my Tweeter and the Bookface. The video that is. That kicks it up a notch! I haven't touched a violin since like 9th grade...alas. did used to play a bit in school though. pre-guitar, barely. Um, I assume that's something good, right? i really wish sub rosa would release all 7 nose+electronic music a-chronology editions as a single set. I'm happy your back on the air, Bethany. This show makes me feel smarter. errr, _noise_, not nose. though an anthology of nose and electronic music would be awesome. @Danne: Basically, "this is a surprise!" or "what a surprise!" Next year's premium: a CD of nose and electronic music! Sounds better than great. Really cool. the 24 bit one has 3 outs: mono, stereo and Sensurround! Love the Omaha shouts. My people are all from there. Hey! Whoever gets the violin, if you actually want to play it, fit it out with fine tuners. The tuning pegs are literally square pegs in round holes, and kind of really super finicky! What an awesome prize! Good luck to the winner! All right! Enjoy, Dave from Morristown! Have a good night, and KEEP PLEDGING! thanks for making it, ranjit! you rewl. guess i maybe have to learn to play.